A couple of fun facts for you. First: prior to kick off at Vicarage Road, Saints had lost just once in five competitive matches this season. 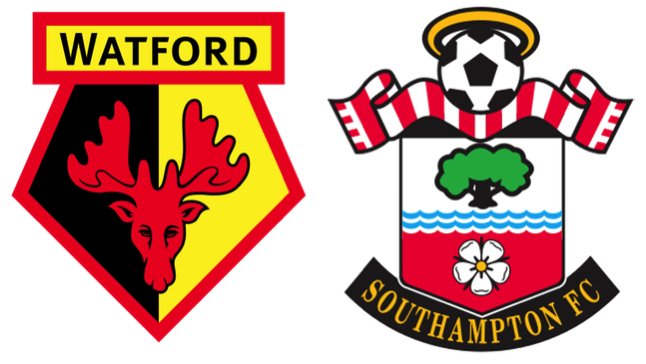 Second: prior to kick off at Vicarage Road, Saints had not won a league match away from home for more than 7 (seven) months. Each fun fact paints an entirely different picture, and the truth probably lies somewhere in between. Certainly, Ronald Koeman was sufficiently dissatisfied with the progress of his team to shift to 3 at the back, his fall-back formation when he senses something is not right. Last season it was mid-December before he saw fit to deploy 3 centre backs and wing-backs. And it was this tactical move that, quite deliberately, wrung the game of any quality. Names such as Rodriguez, Long, Ward-Prowse, Tadic and Juanmi waited on the bench, leaving very little remaining defence-opening creativity for the starting XI. Once Sadio Mane chose not to risk continuing after a few early knocks, it was left to the home team to inject any quality they could find to open up the game. Sometimes it is a perfectly valid tactic to close the opposition out in the hope of finding one spark to ignite the game, and certainly season-long foundations have, in the past, been built on a single, scrappy win. It still came as something of a shock that Southampton, 7th last season, would choose such tactics against a newly promoted team with little Premier League experience. Deploying such tactics can also go the other way, and it is the opposition that find that spark of quality to win a tight game. But in the case of this match, there simply was no spark and after 92 minutes, 22 men trudged from the field, sucked of their remaining confidence, leaving the managers to talk of building blocks and stepping stones. Undoubtedly there is significant work for Ronald Koeman to do on the training pitch, and for Les Reed on the black box. For all the talk of the club doing their transfer business well and doing it early, Saints are now 6 games into the season and are no closer to finding anything that resembles a well-balanced team. Like another well-known Dutchman, Koeman only has two thumbs to plug the dam. Having plugged the Clasie-shaped hole with Oriol Romeu, Victor Wanyama alongside him has shown a drop in form, made all the more alarming by recent stories of unrest. Meanwhile, the inexperience of two young full-backs is taking its toll, not least because the reliability of Bertrand and Clyne last season was a lynchpin of the team’s success. And then there is the biggest hole of all. Koeman is currently using Steven Caulker to plug the gap at centre back, but he doesn’t yet look like a reliable solution. Les Reed has a week to earn his corn and finally give Koeman the squad he needs. Finally, another couple of fun facts. First: this time last year, Saints were only 2 points better off than they are now. Second: this time last year, Saints went to a footballing backwater in mid-week and for 20 minutes at the end of the game, it finally clicked. That match at Millwall was the catalyst, and the team surged up the league table. This week the team travel to a slightly more distant footballing backwater but a good win against robust opposition will significantly lift the confidence of a team and manager in need of a boost.